[19:00] We discovered that app providers at the Xero roadshow were sharing email addresses. If you do this, please stop. As participants we don’t consent to it and it may be illegal. Jason Andrew is no ordinary accountant. Whilst running his own firm he found a way to spend 18 months writing a book about accounting for entrepreneurs. It's great to see Accountants out in public entering the public conversation about business success Good on ya' Jason Robinson on Kochie and Jase Andrews on Your Money. How come so many veteran consultants are advising banks to put customers first? Shouldn't this have been obvious? Quickbooks have advertised a test to actually do the bookkeeping for small and micro businesses at a very low price point upsetting a lot of their fans. But we don't think it's such a big deal. Do you really want THOSE clients? At THAT price point? Doing THAT kind of work? 2017 Quickbooks Firm of the Future winner Lielette Calleja joins us to discuss the response from the Aussie bookkeeping community (almost nothing) and we ask if the fearful response is just a giant beat up. Public accounting will make you fat miserable and diabetic, or will it? Will single solution tech ultimate let you down as the big players include their features. The big 4 fail in the SME space, again. 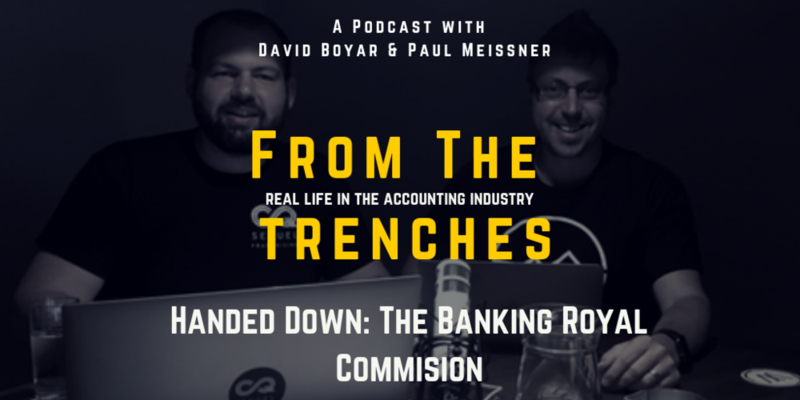 Check in the show for our discussion about why the Royal Commission couldn’t have been good because the banks share prices went UP! 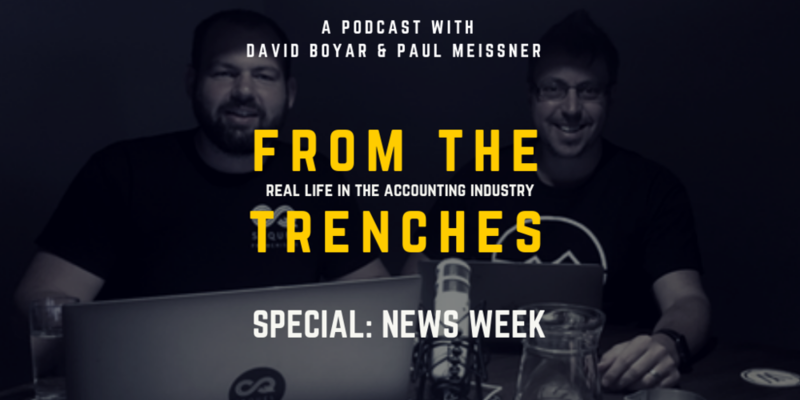 We also discuss how mortgage brokers are responding and why the lawyers always win. The ATO's engagement with agents on Twitter is hilarious! Xero wants to change the dictionary meaning of ''Accountant''. Is it just a gimmick? Did the clients expectations match the way you run your firm? Engage your staff, it's rarely their fault. Make sure you communicate the way you work with clients. Respond with strength, hit the business development track, find more leads, close the open ones. Get back into it! Are Finance People full of themselves when talking about the value they create in new CFO roles? Here's a great visual way to see what Zapier can do for your firm. If your firm runs on Microsoft Office, even better 0365 (Microsoft's cloud version) then have a look at Teams for your chat and video call solution. It doesn't have all the bells and whistles of Slack but is built into your tech stack and you are likely already paying for it. Asana Email task creation is ado it yourself way to replicate Karbons great triage feature. Xero URL bookmark lets you bookmark a report and it changes to what ever client you have open at the time. Is this the first of many app startup failures? Are Xero removing email support? Let us know if you like the new changes. David has 3 mentors and rotates 2 of them according to where he is and where he wants to go - all three have different relationships. Paul never formalised his mentors but always had people he followed and looked up to. 3. It was only 1 view, and you never knew the bias’s. BGL - 40 releases last year. When we talk about innovation we should be talking about this. Voice Activated tech is all the rage at CES, will it take on for time sheets? Don’t include financials: This is the accountant’s mistake. This is budgeting. You budget to support your goals. What to stop doing is more powerful than what to start doing. Simplify processes and stop wasted time. We wouldn't have much integrity if we didn't asses our predictions for the year and whilst we are heavily biased into thinking we got it all 100% correct, we didn't. So in this weeks in-depth we mark our predictions out of 10 Matt Paff style and make 2 big predictions for next year. To our listeners, fans, and those who think we’re just a couple of loudmouths, we deeply deeply thank you for all the attention you gave the show this year. We love what we do and we love that so many accountants are getting back that ‘‘water cooler’’ chat through the show. We also want to say a huge thanks to our mates at BGL Corporate Solution. This company has real soul (and a pretty awesome product you should check out) and we are thrilled they will be extending their support of the show to 2019! "Compliance is back in the conversation" say Receipt Bank, where did it go? The future? Hello? McFly? As you get on in business opportunities will present themselves to you that cause you to stray away from your goal. In an era of constant notifications and updates, how do you stay focused?